Teiglach came along with Tina Wasserman when she moved to Dallas in the 1980s. Wasserman, a cooking teacher and the food columnist for Reform Judaism magazine, didn’t literally transport clumps of the sticky pastries whose dough is wrapped around nuts and simmered in honey syrup. But among her most cherished possessions, she packed her recipe for the traditional Rosh HaShanah sweet hailing from Lithuania. “No one had seen it down here,” said Wasserman, the author of “Entree to Judaism: A Culinary Exploration of the Jewish Diaspora (URJ Press, 2010), until she served the dessert to her new friends. She then introduced the recipe in cooking classes. Before long, teiglach became part of the Jewish culinary scene in Dallas. The incident is typical of how Jewish foods have traveled around the world, says Wasserman, whose goal in writing her cookbook was to educate about Jewish culture while providing sensational recipes that tell the story of Jewish history. As Jews migrated from country to country, they carried their recipes and kiddush cups. Like Johnny Appleseed, they spread their favorite foods. But they also adapted to the cuisines they encountered wherever they went. “I wanted to create a link to our ancestry through food,” said Wasserman, who feels that such a connection will keep Judaism alive. “Food is the most direct connection in our brain to memory,” said Wasserman. She began assembling recipes for “Entree to Judaism” with a question: What makes a food Jewish from a historical viewpoint? Her conclusion: Kosher laws and Sabbath observance were the reasons for the invention and evolution of Jewish recipes. For instance, Wasserman says that caponata, the popular Italian appetizer of simmered eggplants, tomatoes, and peppers, is a 500-year-old Sabbath dish. During the Spanish Inquisition when Spain occupied Sicily, 40,000 Jews fled to mainland Italy to escape persecution, bringing with them this make-ahead recipe that can be served cold or at room temperature. “I tried to put the foods we love into a context,” Wasserman said, explaining that she wanted to breathe life into Jewish culinary history. Each recipe in her cookbook includes the story of its origins, when and why it was eaten, and who cherished it enough to bring the preparation method to a new part of the world. “Most of our food customs come from the Middle Ages,” said Wasserman. Jews needed stories to give them hope during the Crusades, when anti-Semitism flourished. While Ashkenazim dip apples in honey to connote sweetness in the new year, Turkish Jews convey the same wishes by partaking in Dulce de Manzana, sweet apple preserves infused with rose water, the signature flavor of many Sephardic pastries. Dulce de Manzana is the first of 20 dairy foods Wasserman serves at the bagels-and-lox buffet she and her husband host at their home each Rosh HaShanah following the tashlich ceremony when Jews, often in large groups, cast away their sins from the previous year by throwing small pieces of bread into a natural body of flowing water such as a river, lake, or ocean. For the past five years, the Wassermans have invited about 110 guests to the meal, including the five rabbis from their Dallas synagogue, Temple Emanuel, the fourth largest Reform congregation in America. 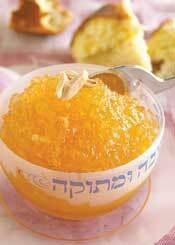 International Jewish foods featured in “Entree to Judaism” are found on their buffet table. Wasserman not only prepares each dish herself but posts a small sign explaining its origin. Many of the deliciously exotic recipes hail from Sephardic countries. One of Wasserman’s favorite recipes is Syrian Eggplant with Pomegranate Molasses, which is similar in consistency to babaganoush. Pomegranates are traditionally eaten at Rosh HaShanah because their seeds symbolize prosperity in the New Year. The recipe is great as an appetizer, hors d’oeuvres, first-course salad, or part of a meze, an array of appetizers typical of Sephardic cuisine. This Rosh HaShanah, try dipping challah into this sweet treat that Turkish Sephardic Jews eat to wish each other a sweet new year. Place the sugar and water in a 3-quart saucepan and bring to a boil over medium heat. While the mixture is heating, peel the apples and grate them by hand with a coarse grater. Immediately add the apples to the hot sugar syrup. Reduce the temperature to medium and cook for 30-45 minutes, or until most of the liquid has evaporated and the mixture is quite thick. Stir the mixture occasionally to prevent sticking. While the mixture is cooking, toast the almond in a 350-degree oven for 4 minutes, or until lightly golden. Set aside. When the mixture is thickened (it will get thicker when it cools), add the rose water or vanilla. Place in an open container until cool. The toasted almonds may be added to the mixture at this time or sprinkled on top as a garnish just before serving. Refrigerate until serving. Finding out that the great Jewish cooks of Aleppo, Syria, used this molasses with eggplant intrigued Wasserman to explore this stunningly delicious combination often served with pita bread. Remove to a colander, slit open on 1 side from stem to bottom. Let the juices run out for 10 minutes, or until it is cool enough to handle. Remove the skin and stem and discard them. Place the eggplant pulp in a clean bowl, cut in all directions with a knife and fork, and continue to mix with the fork, until no long strings of eggplant remain. Add the pomegranate molasses, minced garlic, and red pepper flakes and combine thoroughly. Slowly add the oil as you whip the eggplant mixture with a fork until a smooth emulsion or spread is formed. Season with salt to taste. Spread the mixture on a 9-inch plate and make a slight well in the center. Drizzle with a little more olive oil, and sprinkle with some pomegranate seeds. This Ethiopian recipe is a consistent winner at Wasserman’s Rosh HaShanah buffet. She prepares triple the amount but still finds there are no leftovers. Heat a 3-quart pot over high heat for 20 seconds. Add the olive oil and heat for another 10 seconds. Add the onion and garlic and sautÃ© over medium heat, until onions are lightly golden. Add the water and tomato paste, and bring to a boil. Reduce the heat to low. Add the peas and cumin and cook covered for 1 to 2 hours, or until the peas are tender. It might be necessary to add a small amount of additional water to the pot, if the mixture looks too dry. Conversely, if the mixture is too soupy, continue to cook uncovered, until some of the liquid has evaporated. Remove from the heat and add salt and pepper to taste. Serve hot or at room temperature. Serve alone or over rice. Instead of using pumpkin, this festive casserole from Puerto Rico can be made with carrots, a traditional Rosh HaShanah vegetable that symbolizes sweetness in the new year. Place the butter or margarine in a 2-quart glass bowl and microwave for 45 seconds. Whisk the sugars, flour, and salt into the butter to combine. Whisk the coconut milk into the mixture until thoroughly blended. Add the eggs and combine. Add the pumpkin puree (or carrots) and the mashed yams and whisk until a smooth batter is formed. Combine the water with the spices in a small glass cup and microwave on high for 1 1/2 minutes. Let the mixture steep for 5 minutes. Strain the spiced water through a fine mesh strainer into the sweet potato mixture and stir to incorporate. Butter a 2-quart casserole and pour the mixture into the prepared dish. Bake covered in a preheated 350-degree oven for 1 hour. Serve immediately.